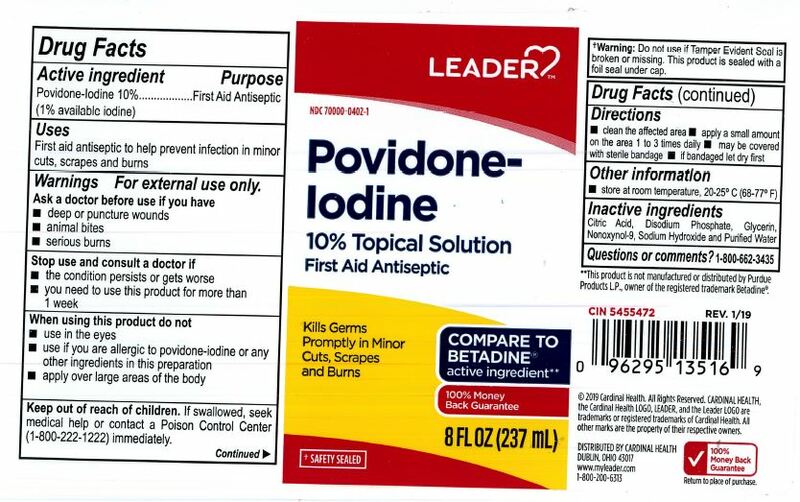 Proprietary Name: Leader Povidone Iodine What is the Proprietary Name? Non-Proprietary Name: Povidone Iodine 10% Liquid What is the Non-Proprietary Name? Leader Povidone Iodine with NDC 70000-0402 is a a human over the counter drug product labeled by Cardinal Health. The generic name of Leader Povidone Iodine is povidone iodine 10% liquid. The product's dosage form is liquid and is administered via topical form. Start Marketing Date: 02-26-2019 What is the Start Marketing Date? Keep out of reach of children. If swallowed, seek medical help or contact a Poison Control Center (1-800-222-1222) immediately.